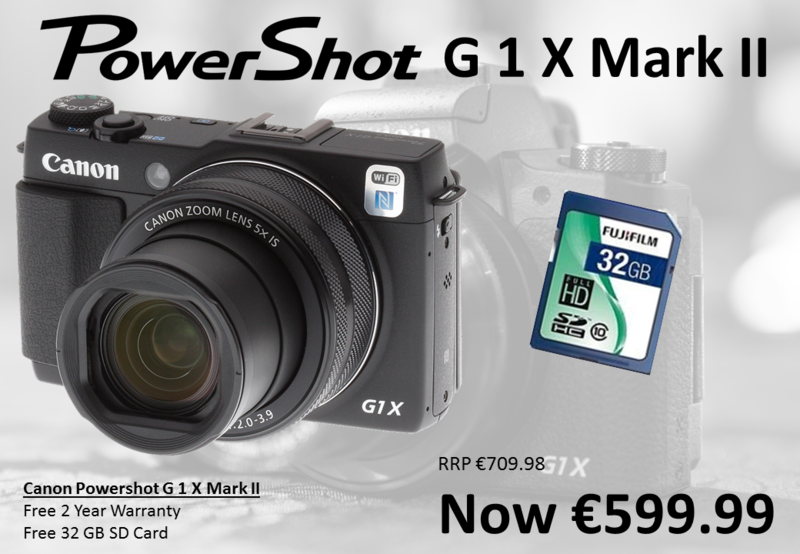 The Canon PowerShot G1 X Mark II 1.5-type sensor and DIGIC 6 processor ensure superb performance right up to ISO 12,800. HS System, combined with a bright f/2-3.9 lens, makes the most of available ambient light, for superb clarity and colour whatever the conditions. Intelligent IS selects the optimum optical Image Stabilizer mode from 8 options to reduce camera shake and blur. The Canon PowerShot G1 X Mark II features an ultra-wide angle 24mm, 5x optical zoom lens. Utilising Canon’s precision technology and advanced lens expertise for sharp, high-resolution images. Large 1.5-type sensor combined with the bright f/2-3.9, 9-bladed aperture ensures excellent subject isolation with smooth background blur. A DIGIC 6 processor delivers fast, responsive handling, so you’ll always be ready to capture that decisive moment with the Canon PowerShot G1 X Mark II. High-density 31-point AiAF locks on to subjects quickly and accurately, while fine manual focus adjustments can be made using one of the camera’s Dual Control Rings, positioned around the lens barrel. Manual Focus Peaking further aids accuracy by highlighting in-focus areas. Tailor the the Canon PowerShot G1 X Mark II to your own way of working. Frequently used functions can be added to a custom menu so they’re easier to find when you need them. Customisable Dual Control Rings surrounding the camera’s lens barrel can be programmed to change different settings. A high-quality LCD touch-screen, with 1,040k dot resolution, uses sRGB colour reproduction for excellent colour accuracy, image clarity and contrast. The tilt-type screen and intuitive controls make the Canon PowerShot G1 X Mark II quick and easy to use, even when shooting at unusual angles. Equip the camera with an optional responsive electronic viewfinder for more traditional handling. The Canon PowerShot G1 X Mark II enhanced Grip Edition (available in Europe, Middle East and Africa) features a large ergonomic grip for excellent handling. Image Stabilisation – ¹ Values at maximum optical focal length. Cameras whose focal length exceeds 350mm (35mm equivalent) are measured at 350mm. External Flash – ¹ Not all functions of the flash are supported. Continuous Shooting – ¹ Sustained continuous shooting function requires compatible SDHC/SDXC UHS Speed Class 1 memory card, total number of frames captured varies depending on shooting subject. Flash – ¹ Not all functions of the flash are supported. Manual Power Adjustment – ¹ Not all functions of the flash are supported.